Everest Base Camp Trek in April Doable? Home / 10 Best Treks in Nepal – The Ultimate Guide for Trekking in Nepal / Everest Base Camp Trek in 2018: The Ultimate Guide / Everest Base Camp Trek in April Doable? “April puts a spirit of youth in everything.”, says Shakespeare. With trees blossoming, the air as pure and as clean as you can imagine, the moods freshening, what’s not there in April to make you happy like a child. Trekking in the Everest Base Camp adds so much more to the beauty of April. Could it get any better? I don’t think so. April is one of the busiest trekking seasons in Nepal. There is a complete transformation into Spring and an invitation to feel, not simply trek Everest. The weather is pleasant and trekking routes are full of fellow travel enthusiasts. Not only the people, the animals and plants show their true colors in the month of April too. The yaks, that are the main animals and a source of livelihood in the Everest region, will be there along the trekking trails. The national flower of Nepal, Rhododendron, will also be available in plenty along the forests that you will go to. The Sagarmatha National Park, which contains plant species such as Birch, Fir and Juniper will be lush green as well. 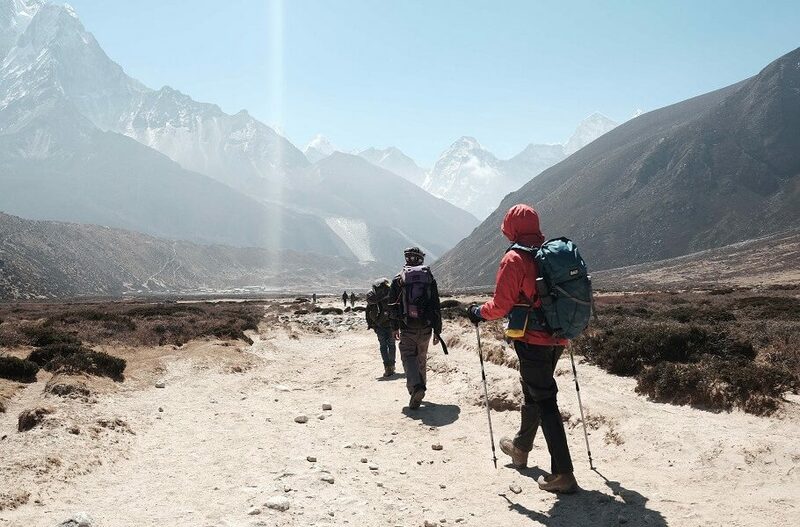 So with amazing climate and plenty of scenic views along the way, let us take a look at the main things about trekking Everest Base Camp in April that are likely to stay in your memory forever. 1. Is weather in the Everest region in April good for trekking? 2. Will there be enough accommodation/restaurants open in April? 3. Should I hire a guide/ porter for my trek? 4. What are the alternatives to the Everest Base Camp Trek in April? 5. Is altitude sickness possible in April? 6. What are the things that I will need to pack for trekking to EBC in April? Scenic flight to Lukla with all the richness in color of the mountains, skies and forests along the way is a guarantee that this is a flight whose memories are going to stay with you forever. Tengboche Monastery is a monastery which has close ties with Tibetan Buddhism. This is full of people in this season. So you will get a chance to know the people of faith and dive deep into Buddhist philosophy. The views of the mountains such as the Everest, Lhotse, Cho Oyu are unforgettable. After all, this is the reason why so many people flood into this area around this time. Khumjung, the region which has schools of the Edmund Hillary foundation, is wonderful to visit the schools reopening in this month. This way you’ll get to interact with students and children alike and learn about Nepalese people more. You can also pass through various mountain passes such as the Kongma La pass, Renjo La pass, and Cho La pass with ease as the climate is soothing and the temperature in the nighttime is pleasant too. Besides all these wonderful prospects in the Everest region, you might also have some other queries. I’ll try to sum up all your questions in the following frequently asked questions about the Everest Base Camp Trek in April. Well, if you ask me, I’ll tell you that there is no better month in which you can go for trekking in the Everest region. Sure, there are other months where the weather is as good as, if not better than, April. April marks the beginning of the Nepali New year. Thus the Nepalese are in a joyous mood all along the month. April is not the month of monsoon in Nepal. So you don’t have to worry about the rain as the chances of rain is pretty low. This is also the month which is known as “Basanta Ritu”, a month which is considered to be romantic by Nepalese. The daytime temperature in the month of April can be around 18 degrees. This temperature is ideal for trekking as trekking also generates a bit of heat in the body, making 18 degrees a perfect temperature for trekking in the mountains. The nighttime temperatures are also bearable. It is consistently above or around the 0 degrees mark. This temperature is expected no matter which mountain you go trekking. So this shouldn’t be worrisome. The lowest temperature during the nights can be -5 degrees. If you come fully prepared in terms of clothing, you won’t have any problems. There are some seasons where the temperature goes as low as -15 degrees and with proper packing, they complete the treks. So -5 shouldn’t be a problem. And remember, -5 is the lowest, not the average! You bet!! From the middle of March, when the trekking season begins in full flow, places of accommodation will be open in plenty. There will be other travel enthusiasts like you. The places will be open for each and everyone. Accommodation means that the restaurants will be open too. And in the April season, fresh graduates from hotel management courses will join the new restaurants to serve you with new ideas and new cooking recipes. The safest way to get to Everest Base Camp is by contacting a travel company. They facilitate you by providing plenty of guides you can choose from. Guides and Porters are extremely necessary while trekking. There is nothing better than not carrying your backpacks. When you are trekking to the Base Camp you are likely to be exhausted because you will carry a lot of items in your backpack. Add in the fact that you will trek for about 2 weeks on average. Thus porters will come in handy. Besides, if you happen to be catch altitude sickness, the fact that your bags will be transported by the porter will give you a huge sigh of relief. In addition, travel companies will also provide you options of medical insurance. Some travel agencies also provide helicopter facilities to you to nearest medical institution to cure your problems. Cho La Pass as well as Kongma La pass are two beautiful passes that will enrich your trekking experience in the Everest region. Both of these passes are located at an altitude of more than 5000 meters. There are two different types of high pass treks in the Everest region. You can either do the Everest Base Camp High Passes trek which lasts for 22 days. You can choose the Everest Base Camp High passes and Island peak trek. In the Island Peak trek, you will go to the Island Peak Base Camp and climb the Peak as well. But the Jiri to Everest trek is one of the longest and treks that helps you acclimate your body to high altitude better than any other trek. Jiri, a place in the scenic Dolakha district, is the starting point of this trek. This place is located at an altitude lower than Lukla Airport in the Everest region. Lukla is located at an altitude of 2900 metres while Jiri is 2000 meters above the sea level. This trek lasts for 26 days. And these 26 days in the Everest region will rank amongst the best 26 days of your life. Helicopter trek reduces the time that you allocate to trekking and therefore is a very good way of experiencing trekking as well as flight in the Everest region. The Helicopter trek can be completed by people of all ages. You will trek around Namche Bazaar, which is located at an altitude of 3400 meters. To get to the Everest Base Camp or Kala Pathar, you’ll get to ride in a helicopter. So you will not trek extensively, and experience mountains in the Everest region too. Yes. Altitude sickness is a property of altitude, not of seasons/ months. So the fact that the weather is pleasant will not keep altitude sickness at away. But altitude sickness can sometimes be brought about by fatigue. In cold, your body loses the consumed calories easily. But that is not the case in April. The warm temperature means that the energy from the body will not be lost easily. So you should check the amount of food and water intake in your body to ensure that you don’t suffer from altitude sickness. You should carry a backpack that will help you store all your belongings ranging from electronic gadgets to all the proper clothing. Bags with compartments will help you with easy access. If the backpacks have a large volume, all the better. In case to want to pack heavier, they will help keep your belongings nearby. Trekking boots need to be comfortable and do away with any problems related to heels and high pressure on other areas. Down jackets, trousers, sunglasses, sunscreen, winter gloves and hats, multi-layer clothing, toiletries, water bottle and basic first aid should come first in your priority list. For a comprehensive list of things you will need to pack to get to the Everest Base Camp, visit this page. Enjoy your trek in the Everest to the fullest with a trek in April. The spring gives you beautiful scenery, wonderful people and amazing views to take some of the most amazing photographs. Also the photographs will not be restricted to just mountains. People, greenery and animals and your joy can be captured perfectly in this month. The flight cancellation rate is very low because of the clear skies you are bound to get. And with so many travel enthusiasts along your way, you can share your experience, your laughs and cheers with them. Isn’t that just perfect? Isn’t that just April?